Walking into the Coco Asian Bistro from a typical hot, sunny, summer day in Fort Lauderdale outside is like coming into a beautiful oasis! At first it appears to be dark with booths on the left, tables throughout and chandeliers that appear like stars in an ink sky. Am I being too romantic? Well it is that type of place which also includes a beautiful red rose in a small bowl filled with water. Upon entering we were greeted by both the hostess and cashier and as soon as we were seated the server came took our beverage order returning almost immediately with it.The service was excellent including the busboy who heard James say he wanted some sauce to make his dish spicier and brought it to the table before he could ask for it. 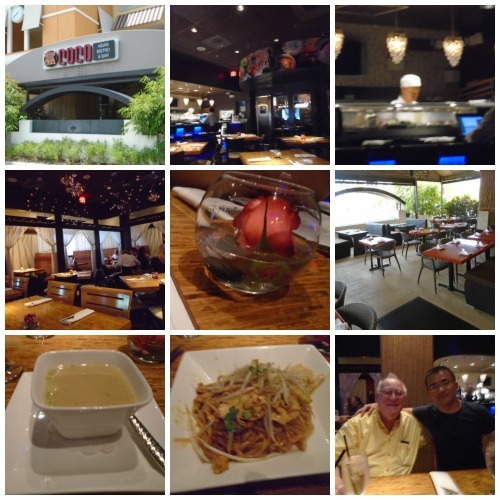 Coco Asian Bistro has a very varied menu but being a creature of habit I usually test a place by ordering a particular dish. In a Mexican restaurant I would order Fajitas, an Italian restaurant Linguine with white clam sauce and so on. In an Asian restaurant with Thai food I immediately go for the Pad Thai and that's what I ordered having a choice of adding chicken, pork or tofu for $9.50 per dish or adding beef, shrimp, scallops or squid for an additional $2. Hate to say it but the 3 of us ordered the same thing all adding chicken so I will have to go back and try a few of their other dishes. Allen and I also had diet Cokes at $3 each. The soup was hot and tasty and the Pad Thai was one of the best I ever had and there wasn't a spot left in/on any of our plates. The check was reasonable considering the quality off the food, certainly the service and the ambiance. For 3 of us including tip the check came to $15 each for a very satisfying lunch. This is the second 'bistro' in the area we have eaten in recently--the other being the Bistromezzaluna--and they are both definitely winners! PS A definite plus--the TV wasn't on!